I got a box of Haitai’s crushed pear juice at Hankook a while ago and finally got to it! I really like how the box is designed; you can transform the box to have a carrying handle! The crushed pear juice is very refreshing when it’s drank cold. 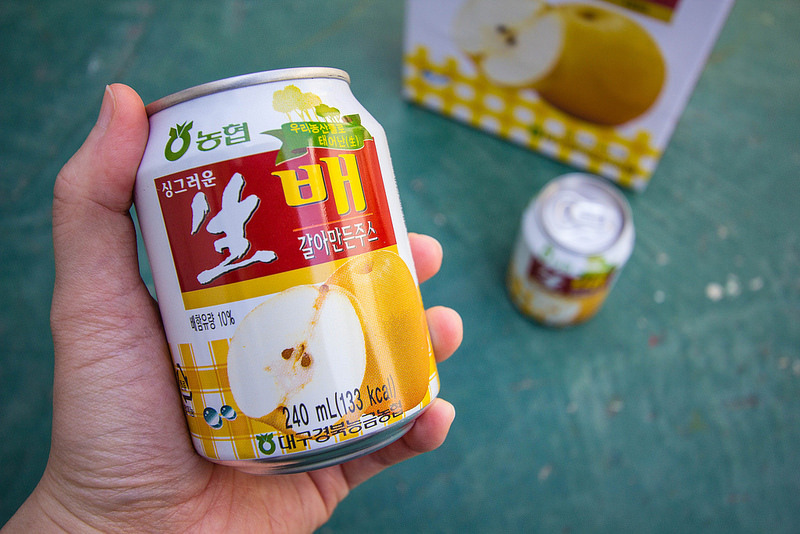 The best part of the drink is when you get to nibble on the crushed Korean pears! Since introducing this product into the market in 1995, it has been the best selling product in the history of Korean beverages. It is still the top selling product in the market. Crushed pears have also been known to be a remedy for hangovers and an intestinal metabolic, which appeal to consumer’s wants and needs. The Korean pear has been known as having the best quality and taste among pears throughout the world. In fact, it has been rumored that Michele Jackson also consumed Korean pears, while on a tour in Korea. The concept of advertisement “Crush and Drink” has appealed to consumers so well that it has helped to increase its sales volume. After the Crushed Korean Pear Drink was introduced, Haitai then marketed a series of other fruit dinks: Crushed Carrot, Crushed Apple, Crushed Strawberry, Crushed Korean Ginseng, and Crushed tomato.